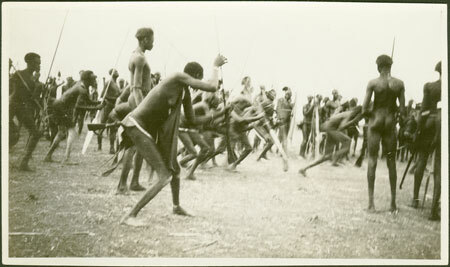 Looking from the surrounding circle of onlookers in towards the central dance area, a number of youths can be seen performing a mock battle dance movement, half crouching with spears brandished, moving forwards. A young woman in the foreground mimics their dance gestures with a dance stick. Such dances were regular social events, often also accompanying ceremonies such as marriages. Such events were the main arena for courtship among Nuer youth, and often took the form of mock battles and display between village groups. Morton, Chris. "Nuer dance gathering" Southern Sudan Project (in development). 03 Jan. 2006. Pitt Rivers Museum. <http://southernsudan.prm.ox.ac.uk/details/1998.204.5.4.2/>.